Tall pink oleanders line the streets of Trapani, capital city in a corner of western Sicily. Palm trees and others that remind me of ficus trees also provide shade as we travel through this city on the largest and most luxurious Mediterranean island. Thick stone walls dating from the 1500s surround the city--remnant of its turbulent past that remind us it wasn’t always glamorous. Walls and fortresses provided protection in ancient times. 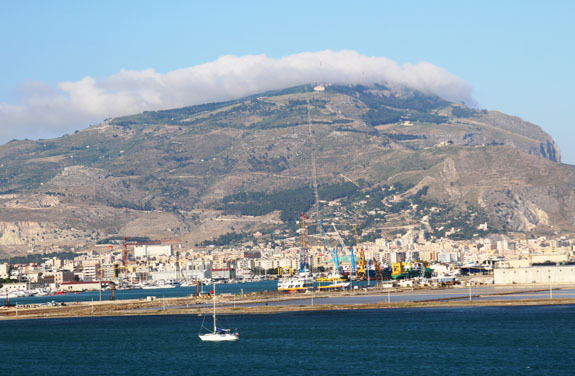 Trapani is a port on our Mediterranean cruise which is substituted after terrorist actions canceled our scheduled stop in Tunisia. While that was a disappointment, we discover a magical region that we might otherwise have missed. 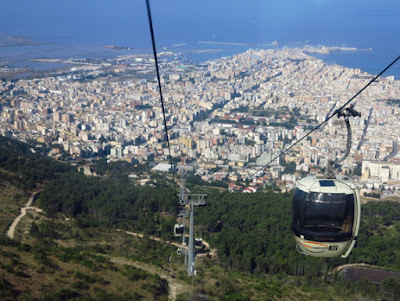 excellent views of Trapani and the island. People have lived on the islands of Sicily since the 8th century B.C. The Romans arrived in 200 B.C. and planted wheat fields to use the island as a granary. Later, the Byzantines from Turkey and Greece, then Egyptians, Tunisians, Africans, and Normans occupied the island. 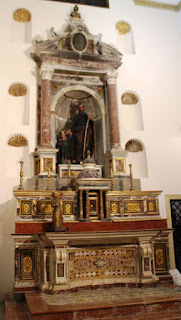 Slavics ruled until 1215 when it became a vice-kingdom of Spain. In fact, Sicily’s history includes every great nearby civilization through the ages—each influencing the culture and artistic heritage in ways that enchant visitors today. Now a republic, the island still has ties to Italy. 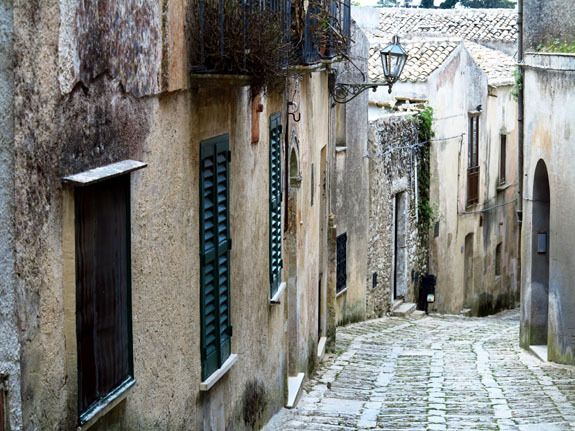 Narrow cobblestone streets add to the character of Erice. We found Trapani to be a lovely, low key town with a beautiful historic center full of baroque churches (not a surprise!). We watch fog roll in and cover the mountain top with a luminous haze. It’s an eerie sight tempting us to go up the mountain via cable car (avoiding a bus ride on the steep mountain road with many hairpin turns). From our vantage point in the air we can easily see the notable “tail” of land that snakes into the sea at the end of the island. 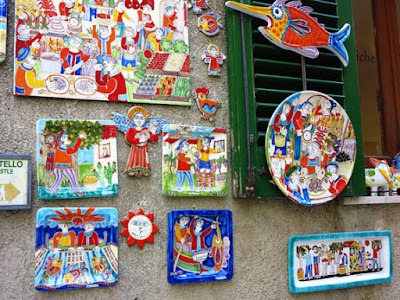 Colorful ceramics depict picturesque scenes from the island. 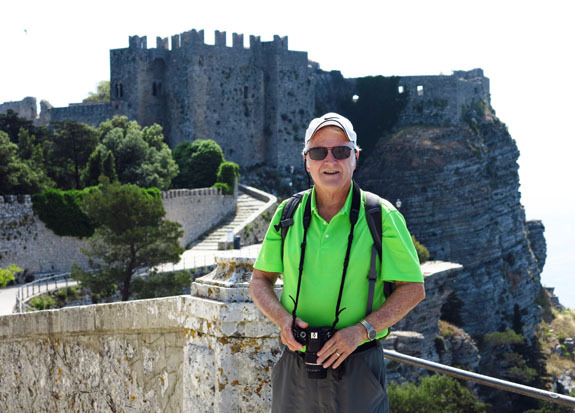 Our destination at the top of the mountain is Erice, a lovely town with a decidedly European flavor. We wander through a maze of narrow cobblestone streets, stopping to explore richly decorated churches, spacious courtyards, and myriad shops. Intricate tapestries and brightly colored pottery in traditional and modern designs displayed outside the shops attract our attention, so we mosey in for a closer look. Part of the allure of this hill top town is the views you see looking out over the ocean. Don’t miss a spectacular overview of the coast from Pepoli Castle and Villa Balio Gardens. It’s easy to understand why Erice has become a favorite holiday destination for for both locals and tourists. As our visit winds down, we stop at a local bakery and purchase samples of the almond pastry for which the town is known. It’s a sweet finish to our visit before returning to Trapani and our ship. 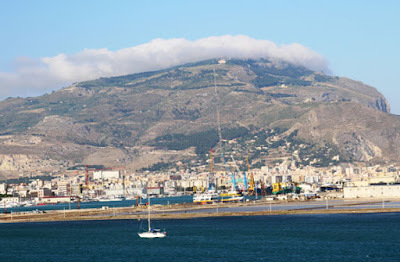 Hope to visit Sicily soon!